A defiant Okezie Ikpeazu on Thursday urged residents of Abia State to disregard claims of his removal from office as governor. Mr. Ikpeazu said the residents should continue their normal business activities, saying there was no legal backing for such claims to manifest. Mr. Ikpeazu’s appeal for calm followed the withdrawal of his certificate of return by the Independent National Electoral Commission which issued same to his challenger in his party’s gubernatorial primaries in 2014. Oluwole Osaze-Uzzi, the spokesman for INEC, said the electoral umpire issued certificate of return to Uche Ogah after Mr. Ikpeazu failed to send notice of appeal against the ruling of a Federal High Court on Monday. Abang Okon, who handed down the ruling, said Mr. Ikpeazu presented fraudulent tax documents to run for governor as allegedly by Mr. Ogah before the court. Consequently, Mr. Okon ordered Mr. Ikpeazu to vacate office immediately. But in a statement he issued shortly after news circulated that Mr. Ogah had been issued certificate of return by INEC, Mr. Ikpeazu said it was wrong for the electoral body to have proceeded with such action since he had appealed the ruling. 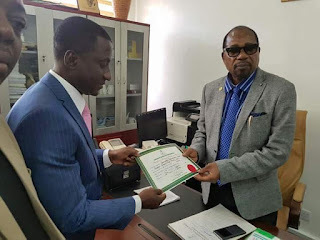 “I have received with concern report of the purported issuance of Certificate of Return to Mr. Uche Ogah by the Independent National Electoral Commission (INEC), as governor of Abia State, despite dependency of a notice of appeal and motion for stay of the orders made by Justice Okon Abang of the Federal High Court, Abuja. “Our laws are clear on this matter. No one may be issued with a certificate of return let alone be sworn in as governor, when there is a subsisting appeal and application for stay. “I want to appeal to Abians to remain calm and law abiding in the face of this provocation, unless and until the appellant courts have conclusively resolve the appeal, the status remains, I am still the Governor of Abia State,” Mr. Ikpeazu said. 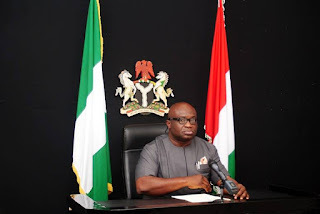 But a source in Mr. Ikpeazu’s office said the governor’s legal team may have made “terrible mistake,” by failing to serve INEC the notice of appeal.